Dual band VHF/UHF, 200 channel commercial / Ham transceiver. . Upgraded 1700mAH Li-ion battery pack. Standard SMA antenna connector. Frequency Range of 136-174, 350-470 MHz RX/TX. FM: 76-108 MHz (RX). Frequency Range of 136-174, 420-520 MHz RX/TX. FM: 76-108 MHz (RX). The KG-UV6D features a long operating time (about 13 hours), thanks to the standard extended life 1700 mAh high capacity Li-ion battery pack. •RPT: Additional programmable multifunctional key. Can change shift direction or reverse frequency, or activate fm radio, lamp, stopwatch or alarm. 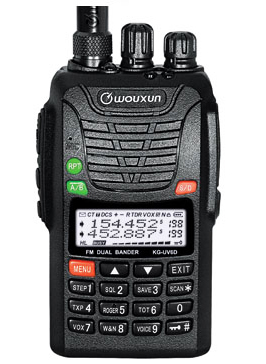 CTCSS rx/tx included (50 groups).